Blaine Ramsey has an unusual occupation. He travels to foreign countries and lives like a native. He drinks in the culture with his mind, body, and soul. And he does it all in the name of capitalism, for Blaine is an Image Digger, one of an elite few blessed with the power to "dream" authentic images from the deep unconscious of foreign lands that are turned into alluring psychologically active advertising to sell products. But in a dusty Middle Eastern villa, something goes terribly wrong. Blaine is haunted by the recurring image of a young Arab beauty suffering a brutal attack. For Blaine, her image becomes the seductive source of romantic obsession -- and a nightmare from which he cannot escape. And as Blaine is about to discover, her appearance in his dreams foretells tragedy -- a disaster the likes of which the world has never seen . 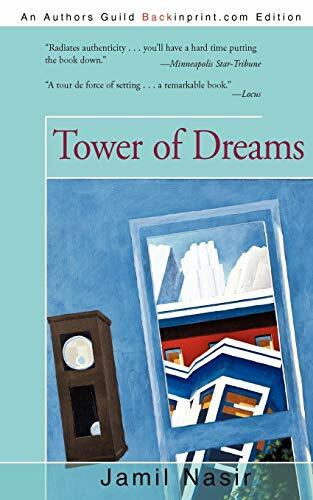 . .
From the Author&colon; How I Dreamed "Tower of Dreams"
"Tower of Dreams" flowed from many compulsions. First, I had found portrayals of the Middle East in most science fiction to be the most astonishing malarkey. I wanted to write about its hot, jostling, ancient, human-intense feel, its blinding days and jasmine nights, its silent ruins baking in the stillness of orange groves. Then there was Cairo, haunting and indescribable, from the cabaret boats plying a Nile lined by luxury hotels to the slum towns in the vast, dusty graveyards; from the hot, packed markets dinning with low-tech commerce to the tranquility of the ornate mosques; from the beautiful 5,000-year-old stone goddesses in the Egyptian Museum to a movie industry thriving on kitsch and a language so supple and passionate that even the gaudiest melodrama gives you chills. Then there was Aida, an Egyptian movie goddess as beautiful and powerful as any of her sisters in the Egyptian Museum, an incredible being exiled by some odd chance to the backwater of Egypt's Third World film industry. And there was my wondering, ignited always by the sun-blinded days under the muezzin's call from the mosque minarets, whether a spirit really does lean down over this world, guiding everything somehow mysteriously from within. And finally, waking in the early dawn at my father's house in the eastern Jordan Valley, a nightingale singing in the still, water-cool air of the garden, I saw the image of the dream-woman climbing the garden wall, innocent and dignified and childish, like the desert incarnate, and all my pent-up streams of thought rushed together in sudden inspiration, and this book was the issue.